Koshi Tappu Wildlife Reserve is situated on the floodplains of the Sapta-Koshi River in eastern Nepal. Established in 1976 with an area of 175 sq. km. covering the reserve can drive from Kathmandu about 10 hrs. or 40 minutes fly to Biratnagar and 30 minutes drive to resort. 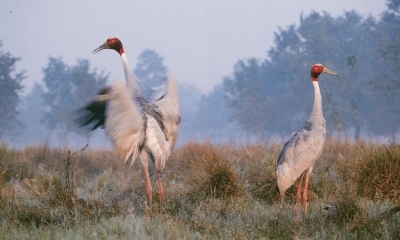 The shuklaphanta wildlife reserve is situated in the southern part of Far-West Nepal in Kanchanpur district. Shuklaphanta jungle is one of the less visited safari destinations of Nepal but it is the perfect destination for jungle safari. 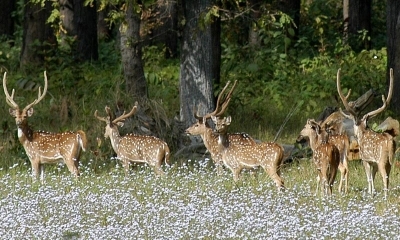 Shuklaphanta Wildlife Reserve is situated in the extreme south-west of Nepal, covers an area of. 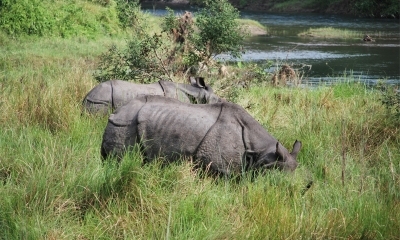 305 sq km and ranges in altitude from 90-270 m.
Chitwan National Park was declared UNESCO Natural Heritage Site in 1979. This park is situated in southern central Nepal, covering 932 sq.km covered with deciduous forests overlooking the floodplains of Narayani, Rapti and Reu rivers. The park headquarters at Kasara is 21 km drive from Bharatpur which is 20 minutes by air or 146 km by road from Kathmandu. In this park there are many resorts, hotels and lodge to accommodate.